HOW TO CARVE: A PANDA! - What About Watermelon? 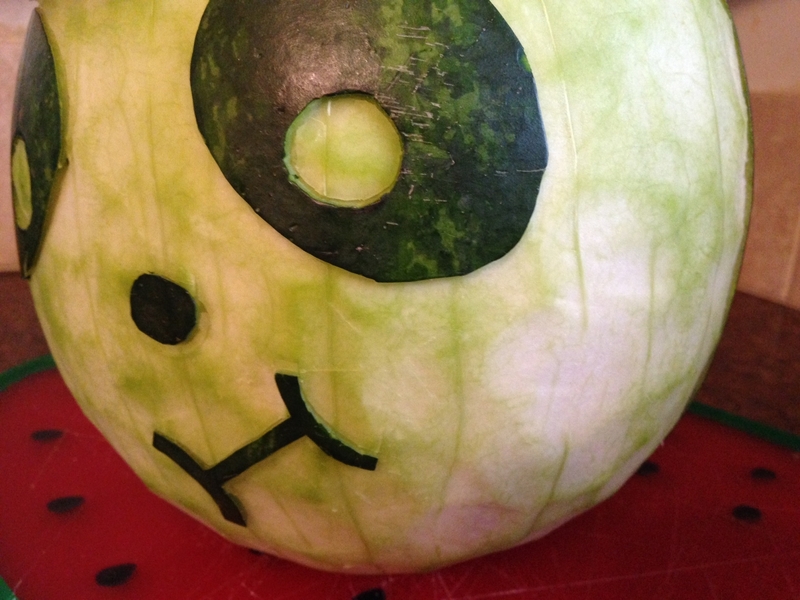 You are here: Home / Watermelon Carving / HOW TO CARVE: A PANDA! HOW TO CARVE: A PANDA! It’s carving season, folks. 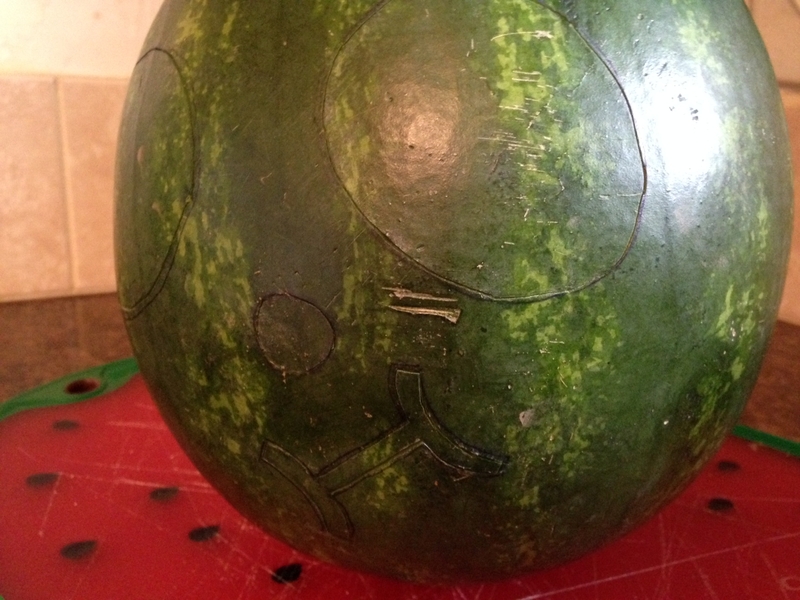 The 2015 Watermelon Carving Contest is officially underway, so get your carvings in before the August 3 11:59 PM deadline. To enter, visit the official contest Web page and check out my blog entry from earlier this month for details about categories and prizes. Of course, I’m not eligible to enter the contest, but I won’t let that stop me from making my monthly carvings here on the blog. Last month’s Stegosaurus turned out well, so I decided to create another animal — a cuddly, adorable panda. Unlike many of my carvings, which involve traditional cuts to the watermelon rind, this one uses the technique of shaving away the dark green outer rind to expose the white rind underneath. Without the right tools, it’s a tricky process, so I made sure to pick up a brand new (sharp!) paring knife, since my current paring knife is a little dull and I don’t have a sharpening stone. First up, one watermelon. You’ll want one that’s mostly round. And, as always, before you cut into it, be sure to give it a good bath. Next, draw your panda eyes, nose and mouth on with a pen. After that, trace around the inside of your lines (leaving the pen-marked part on the outside to get carved away later). You’ll want to trace about a quarter of an inch deep so that when you’re shaving away the rind, the rind will break away from the eyes, nose and mouth cleanly. Next, using your SHARP paring knife, carve away the outer rind bit by bit. The entire process will take only about 15 minutes. Be careful around the eyes, nose and mouth. It’s not super important to get all the way down to the bright white rind, but be careful not to go too deep and expose the red flesh inside. As you can see, I left a little of the light green rind on there in various places. The last step is to cut out some ears. To do that, just cut away the back of the panda’s head, removing one quarter of the watermelon. You can hollow him out and use him as a fruit basket if you’d like. My four-year-old named our carving “Chompy.” And, yes, Chompy does appear to be eating himself, which is a little weird if you think about it. For more watermelon-carving ideas, check out the carvings page of the National Watermelon Promotion Board website!